It was a long time ago and I don't remember when or why I said it, but I do remember telling someone of a tidbit of parental wisdom shared with me by my father: stay away from blonds and carburetors, they're bad news. He never said it, of course, but even so it has been a tenet that has served me well, particularly with carburetors. My perception of them has always been that they are delicate, finicky, internally complex, and quite simply best left to experts. That could be true of blonds as well, but I have never had occasion to find out for sure. That is no longer true about carburetors. For reasons that I will get into in a future posting, I had occasion to remove the left carb from the plane to provide better access to a recalcitrant nut/bolt combination. I didn't consider the simple removal and temporary re-positioning of the carb to be especially risky. They've been off before as part of the initial engine installation without any harm; it's really a simple operation involving not much more than unhooking a spring, loosening the screw on a clamp, and wiggling the body of the carb side to side to remove it from the rubber cuff that holds it in place. Upon replacement of the carb after the work was done, I ran the engine to make sure all was well. I almost immediately smelled fuel, and that was definitely not a sign of all being well. I shut down the engine and clambered out of the plane to see what was causing the smell. It wasn't hard to find - fuel was pouring off of the drip tray under the left carb. "Well," I thought, "that's not good." Yes, even my internal dialog is almost British in its level of understatement. Once I mopped up the puddle of fuel remaining in the drip tray, I turned the master switch back on, which in the RV-12 also turns on the electric fuel pump. And there it was: fuel streaming out of the plastic overflow tube on the side of the carb. As frightening as that was, it proved that the problem was in the carb and therefore not associated with the other work I had been doing. And thus began a series of restive nights of sleep, with the even-the-least-little-thing-causes-panic hours between 2:00 and 3:30 AM rife with angst over the broken carb. It's difficult, when you think about it, to come up with something more stressful than an engine problem on an airplane located on an airport that doesn't have a qualified engine mechanic handy to offer a helping hand. Sure, I was able to more or less calm myself by repeatedly telling myself that "it's nothing money can't fix," but those last two hours of sleep weren't easily achieved. Let's leave it at this: between the stress of a broken airplane and the normal day-to-day grinding of my soul into a fine powder from the constant frustrations of the day job, well, my nerves were pretty frayed. Mitigating that was the helpful advice available through various sources, all of whom diagnosed the problem as most likely being caused by a stuck float. That sounded about right because I had has this problem once before, back in the days when I drove cars acquired for under $1,000. I had a Honda once that developed a leak in the carburetor float. Unfortunately for me, it did so while I was down in Florida. I will never forget the drive home which was made possible by the use of a pair of vice grips carefully adjusted to squeeze the fuel line just enough to allow for a steady 55 mph. While that was enough to keep the car running, it had two bad side effects: it was 55 mph on the flat parts only; uphill was much slower, downhill was much faster, and it burned through gas a prodigious rate. A rate, in fact, that quickly outpaced my impecunious economic lifestyle of the time. At each fuel stop, I would have to completely clamp down the pliers to keep fuel from pouring into the carb while I was filling the tank. That then required three or four stops on the side of the highway to get the vise grips set just right for the next 100 miles. So yeah, I know what a stuck (or sunk) float does. We're never alone with a problem these days and in short order I had taken the advice of Kyle, Chief Mechanic for The Jackson Two, and subscribed to Rotax-Owner.com, provider of DIY videos and other helpful data for Rotax engines. 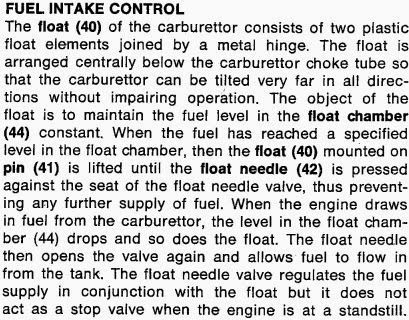 I viewed a video called Rotax Carburetor Disassembly and noticed that gaining access to the floats was so easy that it was accomplished in the first 10% of the video. This alleviated my fears that removing a part of the carb would cause it to spew forth springs and such like the coiled spring snake that jumps out of a joke can of peanuts. So I did it. I dropped the float bowl. And there they were, floating in a tub of fuel without a care in the world, bobbing up and down with no inclination to stick in an untoward position. Like a pair of healthy kidneys, they were. This did not prove that they hadn't been stuck before, of course. I had laid the carb on its side and it's possible that they had become temporarily stuck. I decided that I might as well put the bowl back on the carb and try again. It gushed fuel like it couldn't stand the taste of it. So much for sleep that night. Figuring that I had done all I could do, I started the search for a Rotax mechanic that would make a house call. It took a full day, but I was able to find a guy in Delaware, OH that would make the trip down to take a look as soon as he could find time in his schedule. In the interim, another suggestion came across the transom: perhaps it was the float needle itself that had become stuck. That didn't mean a thing to me, but I did remember seeing it mentioned in the disassembly video. Still, this was too much. I had to know how this all works. Surprisingly, none of that mattered in the least with regards to the immediate concern, but it did make me feel a little smarter. Pressing on, I returned to the hangar (again) and removed the carb (again) and dropped off the float bowl. Again. I'm getting pretty good at it, truth be told. And sure enough, there was the float needle all nicely attached and moving freely, just as Rotax intended. Having ruled out the float needle as the culprit, I was truly at a loss. I decided to just leave the carb partially disassembled for the mechanic to look at. I went back home to give him a call. Then it hit me: just as with the floats before it, the fact that the needle wasn't stuck when I first jiggled it didn't mean it hadn't been stuck before. It was worth one more try. I went back out to the hangar and put the carb back together. With Co-pilot Egg manning the fire extinguisher, I started the engine up again. Not a drop of fuel spilled. I actually fixed a carburetor!! Dave, while you may be able to Google how to fix a carburetor, there is *no* way to fix a blond. Blonds do not come with an operations handbook. A blond is like flying IFR with your entire panel flagged "inop". Most of the time you'll be flying blind.